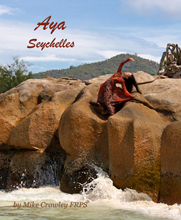 See Inside and Buy AYA SEYCHELLES Aya, my favourite muse, and I have been working together since 2008, and during those ten years we have created an eclectic collection of images in the studio and on location in the UK and further afield. For this trip, we ventured half way around the world to the beautiful islands of Praslin and La Digue in the Seychelles archipelago in the middle of the Indian Ocean. A more beautiful location I cannot imagine. See Inside and Buy ELLA Ella is a beautiful young lady from Lasi in Romania and I first met her in January 2012 when she was living and studying in London. I had the pleasure and honour of photographing her several times during that year and this book is a collection of my favourite images of Ella, my muse and friend. 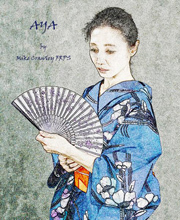 See Inside and Buy AYA Once in a while I get to work with a model and we just click. When that happens the resulting images we make together are more than the sum of our individual efforts. A synergy occurs, the ideas flow freely and something magical happens. This was very much the case when I had the honour to work with a beautiful Japanese woman called Aya. See Inside and Buy JUST EDEN "Just Eden" is the second book in my monograph series, inspired by the legendary Sam Haskins and "Cowboy Kate", and Karl de Haan's "Sunday Sue". It features one of my all time favourite models, friend and muse, Eden. I've called this book "Just Eden" for two reasons; the first because it is just about Eden and the second because this also happens to be the name of her own websites (www.justeden.co.uk and www.justeden.com). See Inside and Buy VANESSA A chance meeting with Vanessa, a friend of a friend, followed by two hours on a beach at Roquebrune, Cote D'Azure, France and a new book is born! See Inside and Buy TRACEY ELVIK Tracey Elvik was an iconic Page 3 and calendar girl during the 1990s who I had the privilege of working with on numerous occasions. This book is part one of a trilogy of Tracey Elvik books and is a collection of my favorite images of her taken in the UK, in the studio and on location in Wales. The 12"x12" coffee tablebook can be viewed and purchased from Blurb here, and the 7"x7" mini-version is available from Blurb here. See Inside and Buy TRACEY ELVIK 2 This book is the second of the Tracey Elvik trilogy and is a collection of photographs from two location shoots, one in Portugal and the other in France. The first half of the book consists of images shot in the Algarve, Portugal in 1993, mostly around the lovely villa Vivenda Estrelicia, the surrounding countryside, and Boliqueime railway station. The second half of the book is devoted to a selection of images from a shoot in France in 1995. The location here was a charming chateau, and its beautiful grounds, south of Angers in middle France. See Inside and Buy TRACEY ELVIK - THE FINAL SHOOT This book is the third and last of the Tracey Elvik trilogy and features some of the images from our final location shoot in Majorca in 2001.